For most small business owners, the switch to a more complex system where you create your own app might sound scary. However, your web design company can create any custom web page on your own website, skin it to no more than 520px wide, and that’s what you drop in to your iFrame app. 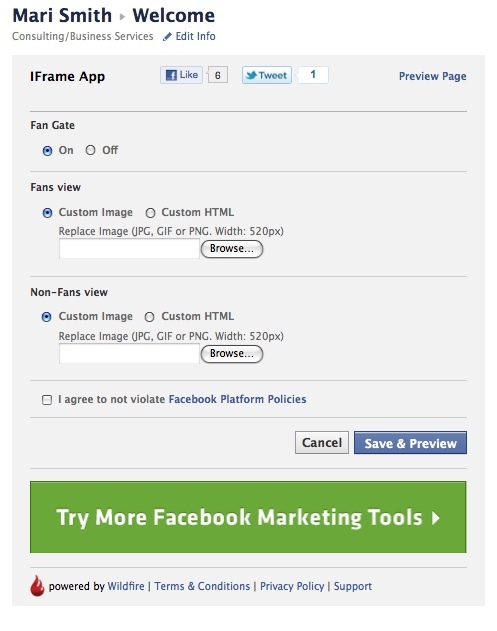 The ability to include some Facebook coding such as Fan Gate (also known as a Reveal Tab) can be tricky with iFrames. Fan Gate is where non-fans who visit your page see one form of content and when they click the Like button to join your Page, the content changes to something just for fans. This is a great feature for special offers, discount codes, free gifts, etc. Good news: Wildfire to the rescue! Just this morning, Wildfire Interactive launched their super simple iFrames for Pages app. I just took it for a test run myself and was very impressed; in just a few easy steps your new tab can be live. You do need custom images and/or HTML though (same as before with Static FBML) – keep reading! I was heartened to see, compared to many other apps, Wildfire’s Request for Permission is very light. They ask for access to the basics only – see screenshot below. After filling out this short form and agreeing to Wildfire’s terms and conditions, the next step is a simple dashboard with three choices. Fans view – where you can upload a custom image directly from your desktop and Wildfire will host it for you. Or if you select the Custom HTML option, you’ll see a small field to enter your code (ideally created in a WYSIWYG editor). Non-Fans view – ditto above! Use an image or HTML. Once you’ve inserted the content you want for Fans and Non-Fans, click the Save & Preview button. Voila! 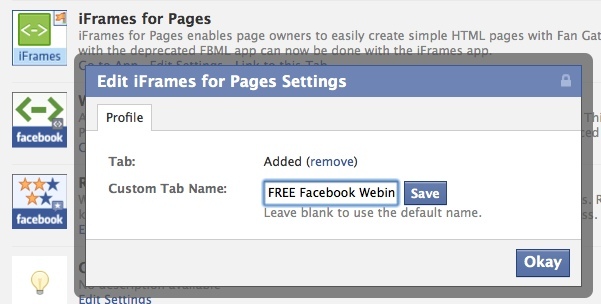 The default name of the “tab” will be “Welcome.” To change the name of the tab to something else (now that Facebook allows renaming of third party apps! ), just click the Edit Page button at the top right of your fan Page > click Apps > go to the new iFrames for Pages app > click Edit Settings > type whatever you wish in the Custom Tab Name field > click Save then OK. This is very exciting! Many small businesses will be able to take advantage of this simple tool right away with very little technical knowledge. See the app in action on my own Page here with my simple demo! 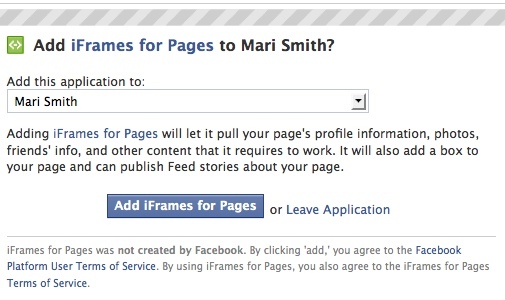 Then go here to install the iFrames for Pages app. The fan gate (when coupled with incentives like deals, contests and exclusive content) has been one of the most effective ways for Facebook page owners to grow their fans/likes. 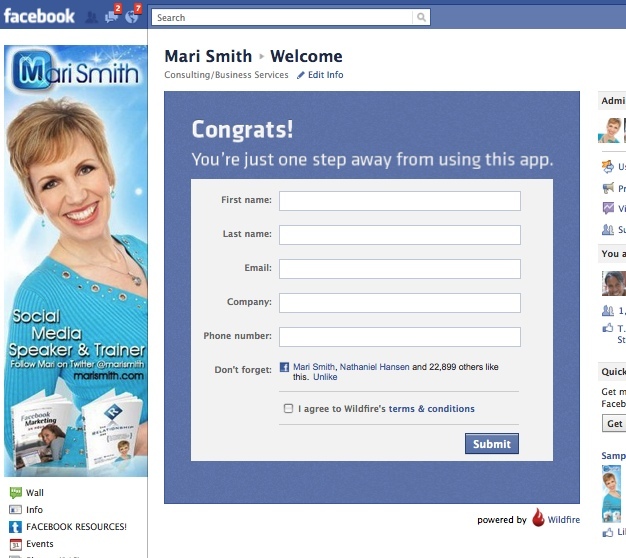 Facebook’s FBML fan gate functionality enables marketers to display one type of content to fans, and another type of content to non-fans, thus providing a great way for brands to encourage Facebook users to “like” a page (e.g. non fans might see a message such as ‘Like us to access exclusive content or a 50% off coupon”). Wildfire’s iFrame application provides exactly the same kind of ‘fan gate’ functionality and the best part is that it’s easy to use and requires no technical expertise. Additionally, by using our iFrame app Wildfire takes care of hosting your content – something that Facebook used to handle via its FBML app but that companies must now handle themselves given Facebook’s change to iFrames for page tabs. Apparently, Wildfire’s iFrame application will be FREE for the next three months. It’s not clear if you install the app now that you’ll be grandfathered in and be able to use the app free forever. Or, if Wildfire is planning to introduce a fee scale where free users will then need to pay to continue. I’m verifying this with Wildfire and will let you know! Meantime, there are a plethora of custom Facebook Page app services out there who are offering all manner of templates and customization. See this post for ideas. I’ll be sure to review more as I can. Plus, hop over to my friend Tim Ware’s blog for great iFrame tutorials for the DIY peeps! 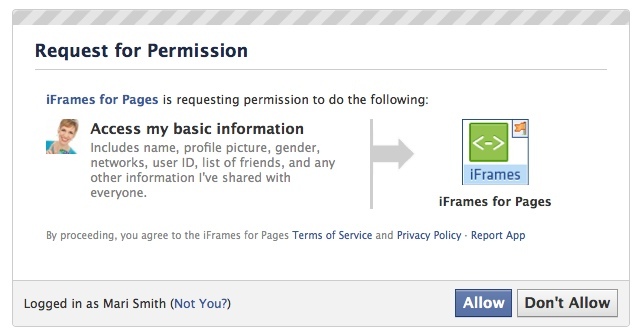 Let me know if you try the new iFrames for Pages app, or if you’ve integrated other solutions. I’d love to know!